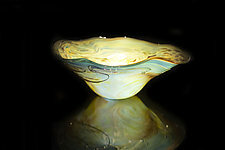 "When I am working with glass, I feel an honest connection with the colors that I have chosen for each piece. 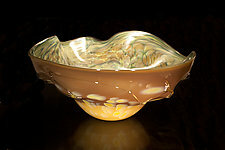 Being able to push the envelope of the material to create colorful, flowing vessels has been the driving force in producing my Signature Series of glass artwork." 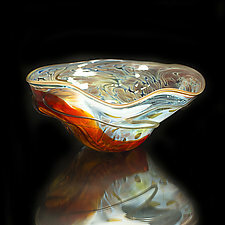 Texas-based glass artist Gail Allard's style of work fluctuates between traditional techniques and free-flowing, organic movements. Each piece has feeling, depth, and character. 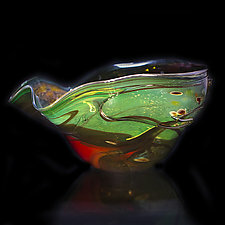 Allard's passion for glass, love of the process, and ability to blend bold colors and control glass's fluid nature allow him to create unique, beautiful works of art. Allard creates each Signature piece by starting with colors that match his feeling and mood. Using rich colors made from gold and silver, he focuses on placing them in an order that will complement the palette and yield the most interesting reactions and layers. Each Signature piece is completed with Allard's silver glass signature, which enhances the exterior and flows with the body of the vessel. Gail Allard was brought up in an artistic home, which nurtured his passion for creativity. He began to explore the possibilities of glass and develop his skills when he was offered an apprenticeship under Bob Rynearson. 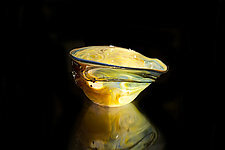 For the last six years, Gail has been creating blown glass art in his studio in Salado, Texas, and his artwork has been collected nationally and internationally.